The Thomistic Institute at the Angelicum in Rome has announced a Symposium, entitled “Thomas Aquinas on Creation and Nature” which will be held October 3-5, 2019 in Rome. Keynotes will be given by Eleonore Stump, Serge-Thomas Bonino O.P. and Paul Clavier. Other speakers include Michael Dodds O.P., Kevin Flannery S.J., Dominic Legge O.P., John O’Callaghan and many others. The Thomas Institute in Utrecht has announced the launch of a new open access journal for the study of St. Thomas: The European Journal for the Study of Thomas Aquinas (EJSTA). It is a joint initiative of the Thomas Instituut Utrecht (NL), the Faculty of Theology of Nicolaus Copernicus University of Toruń (PL) and the Saint Thomas Aquinas Institute for Theology and Culture of the Faculty of Theology (ISTAC) of the University of Fribourg (CH). The Faculty of Theology at the Nicolaus Copernicus University in Torún, Poland is organizing it’s third international conference on the thought of Thomas Aquinas in April 2019. The first in 2015 was entitled “Towards a Biblical Thomism. The biblical exegesis of Thomas Aquinas and its contemporary relevance” and its proceedings were published by Brepols. The second conference in 2017 was devoted to “Towards a Biblical Thomism: Aquinas and the Renewal of Biblical Theology” and its proceedings have been published recently by Eunsa. The third conference, which will be held April 4-6, 2019, is entitled “Identity and Tradition. Thomas Aquinas and the Church Fathers”. The keynote and other main lectures will be given by Serge-Thomas Bonino O.P. (Pontifical University of St. Thomas Aquinas, Rome), Carmelo Conticello (CNRS-Paris), Dominic Legge O.P. (Dominican House of Studies, Washington D.C.), Enrique Alarcón (University of Navarra, Pamplona) and Paul van Geest (Tilburg University). Papers may be given preferably in English and the presentation should take 20-25 minutes. To submit a proposal, please send an abstract of approximately 300 words (along with your name, academic affiliation and contact information) to piotrroszak@umk.pl by November 15, 2018. Notification of acceptance will be given by December 15, 2018. For more info see http://biblicalthomism.umk.pl/ or the full Call for Papers here. The Dominican School of Philosophy and Theology is hosting its 2nd Triennial Dominican Colloquium in Berkeley on the intersection between Philosophy & Theology July 12-15, 2017; the theme will be Person, Soul and Consciousness. Philosophers and Theologians will engage this topic exploring questions of contemporary importance. The event will involve a significant engagement with the thought of St. Thomas, as the list of plenary-session speakers suggests: Lawrence Feingold, Thomas Hünefeldt, Steven Long, Nancey Murphy, David Oderberg, Ted Peters, Markus Rothhaar, Richard Schenk, OP, D.C. Schindler, Michael Sherwin, OP, Eleonore Stump, and Thomas Weinandy, OFM. Cap. The deadline for the Call for Papers is in March, 2017. A $500 award is available to the best graduate student submission. More information is available at www.dspt.edu/conversation2017. Sponsored by the DSPT and the Friars of the Dominican Province of the Most Holy Name of Jesus (Western USA). The 52nd International Congress of Medieval Studies will be held at Western Michigan University in Kalamazoo, Michigan, from May 11th to the 14th, 2017. The Kalamazoo conference is the largest congress for Medieval Studies in the world. The cost of room and board is quite moderate, and the atmosphere is congenial to those interested in Aquinas. The Center for Thomistic Studies, c/o S.J. Jensen, Center for Thomistic Studies, University of St. Thomas (TX), 3800 Montrose, Houston, TX77006-4696. FAX: (713) 942-3464. email: jensensj@stthom.edu. Three sessions will be devoted to any topic about the philosophy of Aquinas, his sources, or contemporary applications of his thought. The Thomas Aquinas Society, c/o John F. Boyle, Department of Catholic Studies, 55-S, University of St. Thomas, 2115 Summit Ave, St. Paul, MN 55105. Fax: (651) 962-5710, email: jfboyle@stthomas.edu. For these three sessions, proposals on any topic dealing with Aquinas are welcome. Paper submissions must include a 300 word abstract and a completed Participant Information Form (which may be downloaded here). The Deadline for submissions is September 15, 2016. Be sure to act quickly if you wish to have your proposal considered! Concordia University of Edmonton is holding a conference on "Theology and the Philosophy of Science: Analytic, Scholastic, and Historical Perspectives," (October 14-15, 2016) and you can still get in on the action. "The Philosophy of Lawrence Dewan: Metaphysics and Ethics. Professor Lawrence Dewan, O.P., enriched the areas of Thomistic metaphysics, natural philosophy and ethics for over forty years. With the outstanding lucidity, depth and comprehensiveness of his work, Father Dewan’s research has become a point of reference for scholars working on various aspects of the legacy of Thomas Aquinas. The specific theme of the Metaphysics and Ethics symposium is intended in part to elicit thinking on the personal contribution of Father Lawrence Dewan to both areas of philosophical research." On a related note, a memorial notice for Fr. Dewan written by Steven Baldner was just published in The Review of Metaphysics. The teachings of the moral part of Thomas Aquinas’ Summa Theologiae continue to inspire and to enlighten theologians and ethicists. Especially for those who are interested in a specifically Christian account of human moral and spiritual life, Aquinas’ ethical investigations in the Summa are an inexhaustible source. In his rich and detailed treatment of both the moral and the theological virtues, however, Aquinas fails to explain unambiguously to what extent the Christian faith determines human moral life. As a result, this topic is the subject of an ongoing debate in the literature. For more information on this excellent opportunity, go to the conference's website. 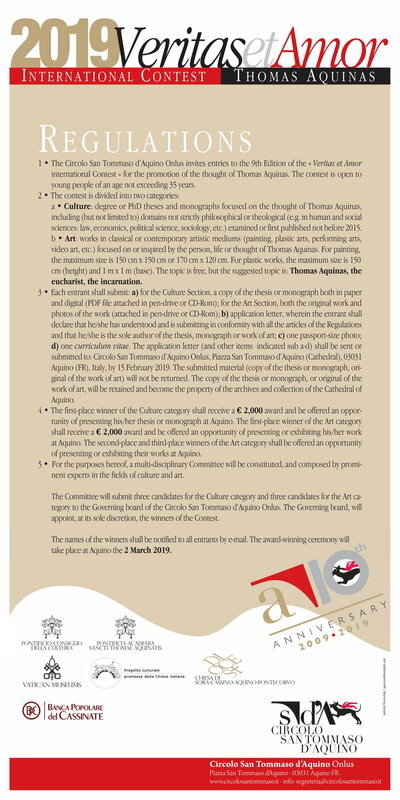 The CTSA's Thomas Aquinas Interest Group has issued a call for papers for next summer's Convention, which is devoted to the topic of the sensus fidelium.